Early this season, there are some similarities connecting the Bucks and the Warriors. Back in 2014, Steve Kerr took over the Warriors. Instead of revamping everything, Kerr made minor adjustments to the Warriors’ system. This unlocked the potential of the entire team, transforming them from a Playoff team into a Championship team. In the offseason, Coach Mike Budenholzer took over the Bucks. Similarly to Kerr, instead of overhauling the Bucks system, he empowered them to move the ball better and be open to outside shots. Milwaukee, a lower-rung playoff team last year is now the second-best team in the East. Another similarity between the two teams, at least in today’s game, was their third quarter dominance. That was the last time the Warriors would be in contention in this game. The Bucks answered with an 11-0 run as Eric Bledsoe rattled in a trey and Giannis Antetokounmpo drove to the rack for an and-one dunk. 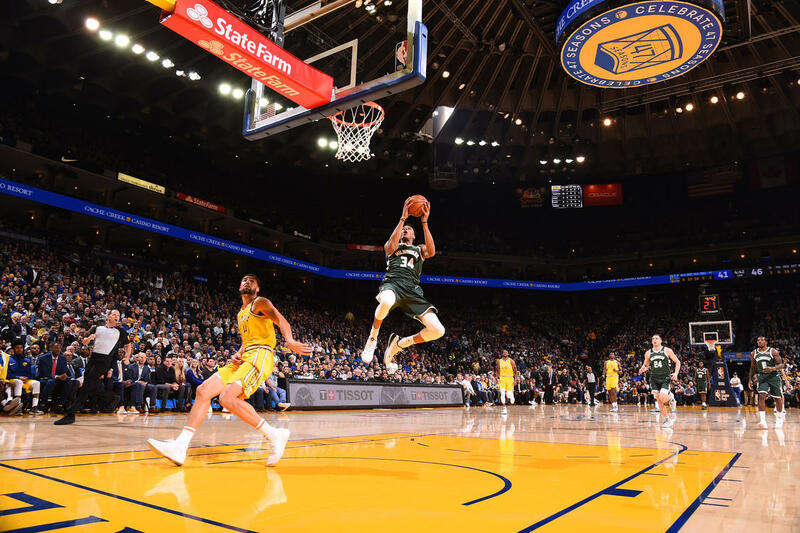 The Bucks gave the Warriors a taste of their own third quarter run, scoring 41 points in the third period to pull away for good. Beldsoe played a crucial role in that third quarter blast, scoring seven straight points to push the Bucks’ lead up to 21 points. He led the team in scoring with 26 points on 83% shooting. Antetokounmpo was plaugued by foul trouble in the second half. But he poured in most of his production in the first half anyway. He had 19 points, seven rebounds, three asssists and a steal in the first half. He finished with 24 points, nine rebounds, four asssists and two steals. This isn’t to say that the Bucks are automatically championship contenders because of the trend they’re following. But it certainly helps to follow the model of a team that’s won three chips in four years. This would have been the lowest point of the Celtics’ rollercoaster season so far. Boston’s offensive woes continued and it came at a bad time. They managed only 35 points in the first half and fell behind by as much as 22 points to the lowly Suns. They even missed 12 straight attempts in the first quarter, allowing Phoenix to run out to a big lead. Thankfully for the Celtics, Irving kept them alive. The All-Star guard led a second half comeback capped with clutch plays in the end of regulation and OT. He nailed a three-pointer and got a crucial steal leading to a layup to cut the Suns lead down to one. The Suns hit free throws to extend the lead back to three with six seconds left in the game. The Celtics went to Irving who was double-teamed near the top of the key. Irving dished to Marcus Morris for the game-tying trey with 1.1 seconds left in regulation. From there, Irving took over in OT. You don’t give a killer like Irving a second chance to beat you. He will bury you like he did the Suns. Irving finished with 39 points, seven rebounds and six assists. The Celtics need to figure out a lot of things moving forward. Irving can’t save them all the time. They need to find their groove if they want to match their preseason expectations. Through 10 games, Carmelo Anthony has more missed shots (72) than field goals, assists, steals, and blocks combined (65). Rockets are 15.4 points per 100 possessions better with him off the court. Against his former team, the OKC Thunder, Anthony continued to put up bricks. He missed 10 shots and didn’t even score an actual field goal. His only two points came on a goaltend. In Melo's return to OKC, he scored 2 points on 1-11 shooting in 20 minutes and didn't actually ever put the ball in the basket. This loss isn’t all on Anthony though. The Rockets shot only 37% as a team and hit only 11 treys at a 26% clip. James Harden and Chris Paul both only shot 36% in this game. The Rockets now fall to 4-6 for the season and only 1-6 in the West.